DO NOT put more weight on your operated leg than was allowed while you were in the hospital. Do you know your “weight bearing status?” If not, ask your doctor or therapist. Back up until you feel the chair against the back of your legs. 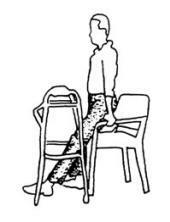 Slide your operated leg forward and lower yourself slowly into the chair using armrests. Scoot forward in the chair with your operated leg out in front of you. 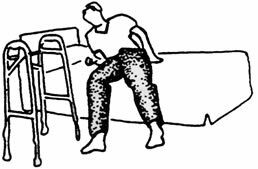 Use both arms to push yourself up to standing, then reach for the walker. 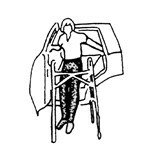 Keep your operated leg facing straight forward when sitting, walking, or lying down. Keep your knee lower than your operated hip. DO NOT cross your legs in any way. DO NOT turn your leg inward. Your feet should NEVER point toward each other. DO NOT bend forward or lift your knee higher than your hip. 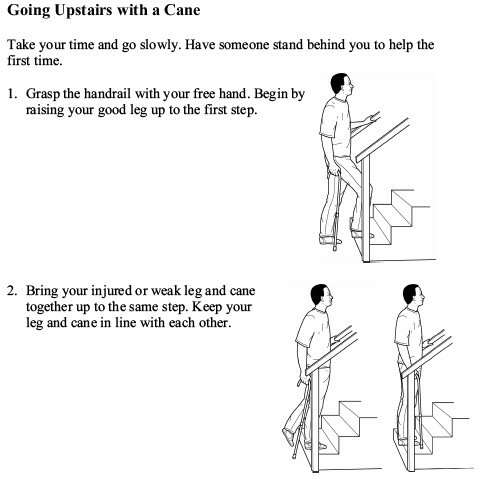 Use one crutch and the stair rail if present (only if the railing is stable and there is someone to carry the other crutch). Use two crutches if there is no stair rail. If both crutches can be held in one hand safely, you can use both crutches on one side and the railing on the other. Hold onto the rail with one hand and the crutch with the other hand. inches below your armpits while you stand up straight. crutches press into your armpits. Sit down on the edge of the bed, reaching back with one hand at a time. Enter the bed by supporting your upper body with your arms and bringing your legs into the bed. You may need help to keep your legs apart. When you are lying in bed, you can sleep on either side ONLY if you have a pillow between your legs. Back up to the front car seat until you feel it on the back of your legs. Slide your operated leg forward, reach back with both hands, and slowly lower yourself into the seat. 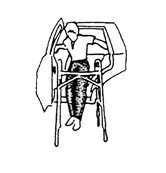 Scoot yourself across the car seat, keeping your operated leg straight. Slowly turn your body so you are facing forward. It may be more comfortable to ride in the back seat if you have a four-door car.